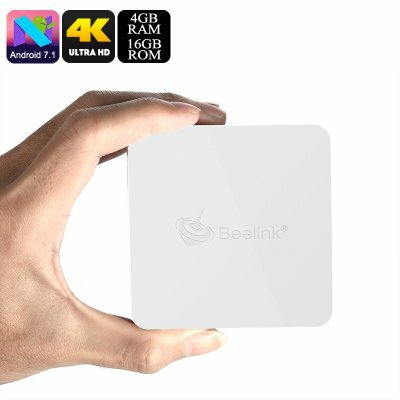 Successfully Added Beelink A1 Android TV Box - Android 7.1, Quad-Core CPU, 4GB RAM, 4K Support, Miracast, WiFi, Bluetooth 4.1, Google Play to your Shopping Cart. Bring unlimited entertainment into your living room with this stunning Android 7.1 TV Box. With its WiFi support, this Android Media Player lets you browse the web, stream movies, and download files straight onto your big screen TV. You’ll be treated to Play Store access, meaning you can easily download your favorite Apps, games, and films. By supporting 4K media files up to 60fps, this 4K TV box is guaranteed to set forth stunning visuals and detail. From now on, you’ll be able to enjoy films and sports games like never before. With its sophisticated Quad-Core processor and whopping 4GB RAM, this Android TV box puts forth a powerful performance. You’ll be able to enjoy the latest Android games, applications, and movies without dropping a frame. The Android Media Player comes with 16GB storage and a 32GB SD card slot. Therefore, you won’t have to worry anytime soon about running out of memory to keep your files and media. Whether you wish to play some games with your mates or enjoy a movie with your kids – this Android TV box is sure to meet your demands. By supporting Bluetooth 4.1, this Android TV box can be easily paired with external accessories such as a wireless keyboard. For an increased user experience, the Android Media Player furthermore supports Miracast. This feature lets you easily mirror all that is happening on your smartphone onto your big screen TV. With this Android TV box at your side, you can be guaranteed that there’ll never be a moment of boredom in your household again.